“Ding Dong”, the doorbell rang!! It irritated me more, as actually, it’s the busiest time of the day for me. I have to cook lunch and breakfast for all of us. Then I pack the school bags, lunch boxes, water bottles of both the kids. Then I run to drop them to their respective school bus stops. And today It’s already late to pack the food. So the unexpected guest on door irked me more. I went to the door to check, My kids ran after me to check whether the guest is their friend. (Actually 86% of our guests who ring doorbell are their friends only!!) but when I opened the door there was a flower bouquet. Kids clapped and wished me a happy birthday by looking at the bouquet((To be clear, My birthday was before 2 months and anniversary too). Hubby dear came out of the washroom to see the bouquet. The courier person handed over me that bouquet and asked to sign on the receiver sheet. After coming inside I immediately checked calendar and tried to remember if there is any special occasion. Kids and hubby were examining bouquet to check the sender’s name. I joined them and we found a beautiful card hidden inside carefully. It had a message written on it. Who must be the sender? and is it for you, me or someone else? hubby asked me. I found handwriting very familiar. And then I exclaimed yeah it’s none other than Rita my childhood friend. She didn’t write her name on the card, but I recognised the handwriting. We spent 10 years of schooling together and know each other more than anyone. We couldn’t meet for last 10 years, as she is located miles away from me. What a thoughtful gesture by the graceful person ever I know. It made my day. Kids and hubby left home and then I could see my bouquet. I couldn’t stop gazing the flower bouquet. I kept it at the centre of my leaving room so that I could glance at it while working. she selected monsoon to wish me rather than any occasion. I called her to inform that I received her gift, we were giggling and laughing continuously for next one hour. We talked about our school days and how we enjoyed the rain, at that time. All my friends have very important space in my life and Rita is more special. with kids, house and routine, I couldn’t realise the fact that it’s raining outside and it’s monsoon. It’s undoubted that I love monsoon. And why do I love monsoon so much? there are many reasons behind it. 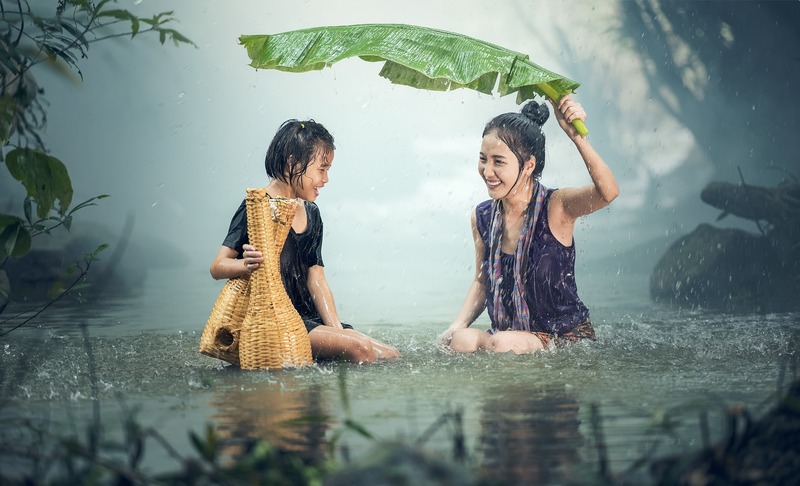 I’m sure everyone has special memories related to rain in the childhood. As a child, I always waited for a monsoon. In June my schools used to re-open after months-long holidays. Getting wet while returning from school with friends was the fun thing. I enjoyed getting wet in rain, jumping in puddles, playing with paper boats. I absolutely love First rain(of the season) and the smell of soil after raining. When it starts drizzling in monsoon, the weather changes to pleasant. Rain makes everything around us new, clean and fresh. Watching rain from the window of my house, was my favourite pass time in childhood. And now also I absolutely love to watch rain for hours. It’s soothing and relaxing to the eyes and senses as well. Now I’m a mother of two kids and I feel monsoon give me a perfect chance to relive my childhood. I love to walk, play and jump in rains with kids. If you haven’t jumped in a puddle, then try it for sure. it’s super fun to play, jump in the puddles. Make loads of paper boats and play with your children in this monsoon. I’m sure everything namely “stress” will get washed away from you with the rainwater. Get wet in the rain at least few times till the end of monsoon and see how refreshing it is. And after all, we should learn to enjoy the small things in life, to live it fully. I absolutely love the weather in monsoons, Moist, cloudy, wet, cool, dark. The smell of soil when it starts raining, it’s something unique and which can’t be recreated. The comfort of getting dry after playing in the rain is something indescribable. Heavy raining and thundering make us realise the importance of our house. Generally, we spend more time on playgrounds and raining gives me more “ME-time”, inside a house, which is rare for the mother. I can spend that hour working on my blog. Another wierd but interesting thing for me, I like carrying a fancy umbrella in rains. Pink and transparent coloured umbrella was the first thing, which I bought from my first salary. Then I like to walk on the road after rains as well. Rain makes everything clean, new and fresh, the weather, the houses, the roads, the trees, plants and absolutely everything, without discriminating. Monsoon rejuvenates the environment, and it’s 100% true. If we find time to observe things around us, carefully, we can see the magical changes. Actually, foodie people don’t need any special season to cook and eat. But I feel monsoon is the perfect season to eat various pakoras,(fritters), fried goodies or just your favourite dishes. Availability of fresh vegetables during the season is another reason to cook a variety of dishes. Rain and hot tea with pakora is the heavenly combination for me. I love experimenting with foods and making various fritters (Using vegetables, cottage cheese)to enjoy the rain. I enjoy my fritters and hot ginger tea, by seating in the balcony for hours, when it rains. So it was all about my monsoon love, which season do you like ? and how do you enjoy it? please tell us in the comments section. A sweet gesture by your friend, I must say! The bouquet got you a fresh deluge of showers this time in the form of memories. Monsoon definitely is one very distinct season that makes you fall in love with it. Its raining outside and it turn out to be exactly the post i wanted to read. Amazing post Roopali. Thank you manas for reading and wonderful comment. Having grown up in a place where there is literally no moonsoon season, I envy you. Great gesture by your friend. I wish your place would have lots of rains. Thank you for reading Janani. we love the rain too – the perfect excuse to wake up late and indulge in pakoras! Thank you for reading Tina. It’s absolute bliss to have pakoras while raining.